After its defeat at the hands of Godzilla, the crystal menace SpaceGodzilla returns to Earth with a vengeance. Following the completion of Godzilla vs. SpaceGodzilla (1994)'s filming, a "proposal tournament" was held among assistant directors in the Kawakita team's staff room. 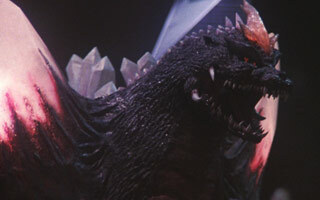 One of three submissions by Yosuke Nakano included SpaceGodzilla's Counterattack, a follow-up to SpaceGodzilla's debut film. Nothing came of this draft, however. The mention of this unmade movie can be found in the 2017 book, Godzilla vs. Destoroyah Perfection (ISBN: 4798615811). While the draft's name was supplied, no plot details are known.